Westford, MA (July 1, 2016) –State Senator Jamie Eldridge, Selectman Kelly Ross, Westford community leaders, the developer, funding representatives, special guests, residents and staff recently joined together to celebrate Stony Brook Village in Westford with a Ribbon Cutting Ceremony. Stony Brook Village was developed by Common Ground Development Corporation (CDGC), a non-profit housing development subsidiary of Community Teamwork Inc. (CTI), which was established to produce affordable housing for home-buyers and renters and preserve existing affordable apartments. CDGC works cooperatively with cities and towns throughout the Merrimack Valley and North Shore to address the critical need for affordable housing. New units are being created through both the rehabilitation of distressed buildings and through new construction. Furthermore, existing apartments will be preserved at affordable rent levels through an extensive acquisition and maintenance program. The expansion of Stony Brook I, now known as Stony Brook Village, includes an additional 36 affordable one, two and three bedroom apartment homes. During the recent ceremony, Phil Geoffroy, Constituent Services Representative for Congresswoman Niki Tsongas, presented a citation to CDGC in recognition of its leadership role in the affordable housing community. Completed in 2006, the first phase of construction at this affordable rental community, formally known as The Residences at Stony Brook I, originally included 15 affordable housing residences. Stony Brook Village now features 51 apartment homes in 13 buildings and is managed by full-service real estate firm, Peabody Properties, Inc. The Braintree-based firm oversaw the leasing of the property that will provide housing for more than 90 residents. 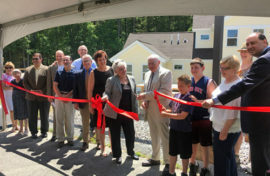 Pictured above (left to right): Muriel Drake, Westford Housing Authority; Carol Engel, Westford Housing Authority; Tony DiCiero, Boston Financial Investment Management; Gene Clerkin, Citizens Bank; Kelly Ross, Westford Selectmen; Steve Joncas, Common Ground Development Corporation; David Rockwell, Massachusetts Housing Partnership; Karen Frederick, Community Teamwork; Catherine Racer, Department of Housing and Community Development; Bill Lipchitz, Common Ground Development Corporation; Chris Pude, Westford Housing Authority; Nancy Wimberg, Westford Housing Authority; and, State Senator Jamie Eldridge.